Ardent divers have changed the length of the UK diving season. When I first learned to scuba dive over two decades ago, the UK diving season would traditionally kick off at Easter, and we would hang up our fins in September / October time. These days modern fabrics are allowing fervent cold water divers to head for the seas all year around. (You can get some quite remarkable viz and flat seas during the winter months). Year round diving does mean your basic thermal protection needs to be augmented, and for once I am not talking underwear. Gloves and hoods come in a variety of thicknesses - 3mm, 5mm and 7mm - allowing you to choose what will suit your needs and expectations. O'Three's latest offering is a 7mm 'Extreme Semi' hood. This Brit manufacturer has constructed their hood from two thicknesses of material. The main hood utilises 7mm super supple neoprene, whilst the yoke is made from 5mm 'Glide Skin'. These stretchy materials are ergonomically cut, glued and blind stitched together. 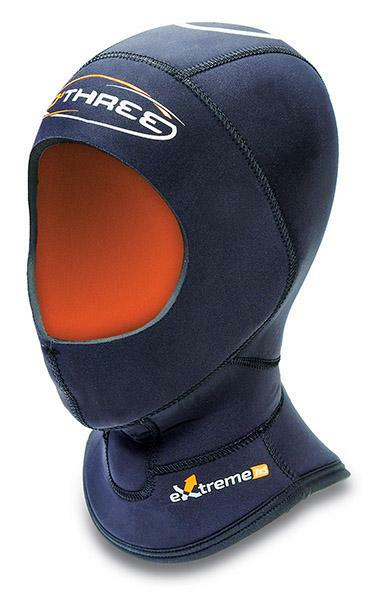 The interior of the hood is then lined in a bright orange soft thermal plush material, with the contour-hugging face seal manufactured from 7mm Glide Skin. O'Three has constructed a 'throat panel' from ultra soft stretchy neoprene. Apparently this golf ball sized neoprene section (located over the larynx / Adam's apple) is designed so that the hood yoke does not restrict the breathing process.